Were you going to buy a 100-1000$ valued USB oscilloscope? No need of that when you can make one at just 2$. Why I am asking to buy a USB soundcard and not to use the PC’s internal soundcard? An Oscilloscope is a device which can analyze realtime voltage or pulse signals and plot their waveform graph in a display. It is also known as CRO, DSO or, an O-scope. 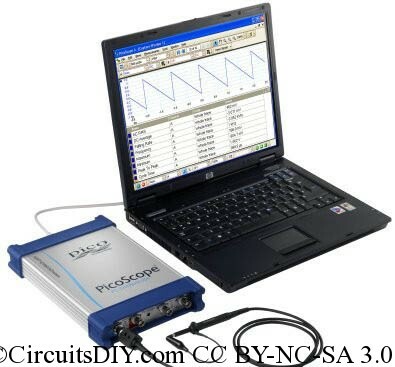 It helps us in analyzing circuit output signals and pulses. Normally it is used in microcontroller projects but it’s also useful in making Any kind of Oscillator for Inverters to check what the output frequency and waveform is. Well, this will work with soundcard. Wait, I’m not talking to use your PC’s soundcard, as if I told so, the USB term shouldn’t have been mentioned. I’m asking you to buy a USB Soundcard. Nowadays they are very cheap. Because, if you give high voltage or spikes to the input, it may burn and if it’s a USB sound card , it will cost 1-2$, but if you burn PC’s internal Audio system, replacing the motherboard will cost you 40$. Well, there are many soundcard oscilloscope software, but I’d recommend you use Soundcard Oscilloscope or Zelscopeonly, because they provide good functional GUI and Soundcard Oscilloscope has signal generator too so that you can generate signals by the sound out port of USB sound card and analyze signals given to the MIC IN port of the USB soundcard. USB sound card can handle +-1V i.e, 2V p-p . If you intend to give high voltage, use voltage divider. Use shielded wire and insulated probes. Got some question or suggestion ? Just leave a comment, I’ll be happy to talk about it. When you hit a USB soundcard with too many volts, how does it fail? Is the motherboard truly safe? The audio controller chip burns in the case. That’s why I recommend using an cheap USB sound card. If you do this directly to motherboard, motherboard’s main audio IC may burn. The PC motherboard will never truly be safe, but putting a cheap sound card in the way as a sacrificial component during the event of a failure, minimises the risk to the PC motherboard. Id rather spend a few $ knowing it’s likely to take the impact before my expensive motherboard. what is circuit this your project? Hi. I think you may have the answer! For a live demonstration I would like to plot the wavelength of different lasers (one at a time). I am looking for a very cheap way of doing this thoughts are: laser diode……photosensor -> [your help] -> your idea for USB oscilloscope. Are you able (and willing to help me achieve this? Some USB sound card are able (after removing capacitor) process DC voltage, some don’t (high pass filtering inside chip itself). It’s mostly lottery as these cheap cards use few different chips but they are not recognizable from outside. For $1-$2 more you can buy STM32F103 “blue pill” – it has two separate ADCs, USB and DMA and it can stream samples to PC continuously with 900kB/s rate. Thanks for the tip, I was thinking about a oscilloscope with STM32, but it’s already done.